'Polvean' is set in it's own private plot within Polpidnick Farm, just outside of St Martin, on the beautiful Lizard Peninsula. 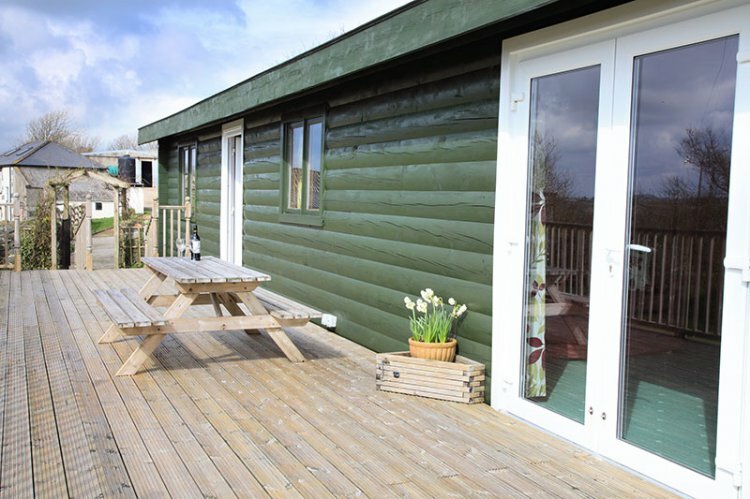 Tranquil and surrounded only by the sounds of nature with views out over rolling fields - you will soon be completely relaxed and ready to enjoy all that this beautiful part of Cornwall has to offer. Set in the countryside the walking that is available right from your door is, of course, amazing. Winding country lanes, bridleways and public footpaths criss cross the whole peninsula and it is easy to reach the coast at Porthallow and Porthoustock or even follow the creek at Manaccan as it leads into the Helford River. St Keverne with its tall church spire, pubs, shops and restaurant is just 1.5 miles. Although set in the countryside you are also within easy reach of the beaches and historic fishing harbours of the peninsula. Kynance Cove, Cadgwith Cove and the furthest southerly point at Lizard Village are all a short 10 minute drive away. Further away, Falmouth, Penzance and Truro are all easily reachable in less than an hour. Polpidnick Farm is a working farm with ducks, chickens, horses and cows, a peaceful setting where the owners are happy to introduce you to the animals if you like. Polvean is a genuine Canadian timber lodge (imported from Canada!) with far-reaching countryside views, a large decked patio and private lawned garden. Entered into the large well-equipped kitchen/diner with washing machine, fridge freezer, microwave, double electric oven and ceramic hob with extractor over and a large extending dining table for six. The lounge is spacious with two x 3 seater sofas, coffee table and LCD TV with freeview and DVD player. Double doors open onto the large deck. Bedroom one has a four-poster double bed, bedside tables and lamps, dressing table and built-in wardrobes. Bedrooms two and three are twin rooms each having two x 3' single beds, bedside tables and lamps and large built-in wardrobes. The large bathroom has a bath, separate shower cubicle with mixer shower, matching sink and toilet and shaver point. Outside you have your own garden furniture on the deck and a large private lawn area. Behind there is a duck pond with benches and a small water wheel (see video). Also detached but on site is property 501 'Pidnick'. The owners live in the main farm house. Rental includes bedlinen, electricity, central heating and two parking spaces. Please bring your own towels. No WiFi. Mobile signal is patchy, check with your network.